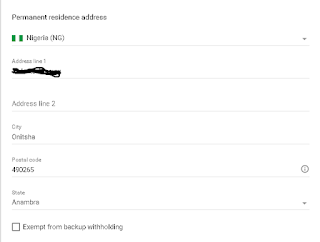 Earlier if you read my previous post on Google Adsense, I wrote a tutorial on How To Withdraw Your UK And USA Adsense Earnings In Nigeria and as promised I stated I was going to write a tutorial on how to verify the tax information, as without tax verification you can't withdraw your earnings comes 21st and this can be very disappointing!. 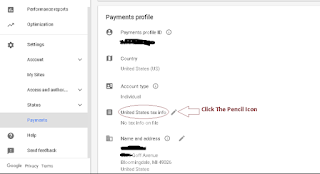 If you are a USA Google Adsense publisher, a question of how to fill your tax information in your Adsense account must arise.This is as a result of the fact that every USA Adsense publisher must undergo a mandatory Tax verification in order to determine how much the individual will be charged as tax. This tax verification must be complete before Google Adsense can release payment to the individual. So today I will show you how to fill your tax information if you are a non-USA citizen so you can receive your payment. Now first of all, you need to first obtain your Tax Identification Number(TIN) Tax Identification Numbers are issued by the Internal Revenue Service (IRS); the U.S. government agency responsible for tax collection and tax law enforcement. The TIN is a 9-digit number which is used to determine individual tax returns. If you don't have your TIN, let me proceed to show you how to obtain it below.. You can skip if you already have yours. With this method,you can get instant TIN. However, you will have to have enough airtime in your phone as international calls are generally costly. Because of the unfamiliarity with our names, a little more effort will have to be made in ensuring that the IRS call attendant understands your sentences. You will also have to strain your ears farther to be able to comprehend the operator's accent. It is advised that before you place the call, you should have to get acquainted with the questions to be expected by studying the SS-4 form . International applicants may call 267-941-1099 (not a toll-free number) 6:00 a.m. to 11:00 p.m. (Eastern Time) Monday through Friday to obtain their EIN. Now you know how to obtain your TIN, lets proceed!.. Login to your Adsense account. Click on Settings and then on Payment. Next click on Manage Settings. Scroll down till you see United States Tax Info. 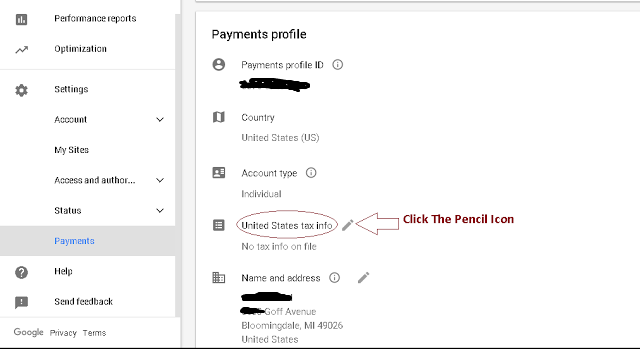 Then click on the pencil icon and click on ADD TAX INFO. On the next page, you will be asked whether you are a USA citizen or non-USA citizen. Please, choose Yes and click on continue. After clicking on continue, you will be presented with the tax for (labelled Form W-9 Tax info) . This is the sensitive part. Remember that among the information you submitted to IRS on the process of obtaining your TIN are your First Name, Last Name, Street Address, City, State, ZIP, Country, Business Name and Entity Type. You are mandated to fill in same to your W-9 Tax info. (Refer to below picture) . It doesn't matter if these information is different from the one in your Payee Profile. Just fill the information and move on. If you are on the right track, the image below should be same as yours. On the first line which is the Federal tax clarification, select your entity type. In my case, I chose Individual/Sole Proprietorship because this was what I submitted to IRS. On the next line which is business name, enter your business name as submitted to IRS. Next is your permanent residence address. 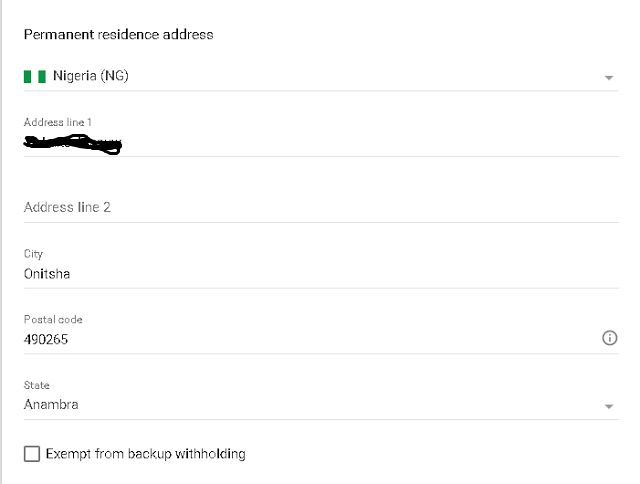 Select your country, enter your street address, city, state/province and zip. These information must correspond with the one submitted to IRS. Do not tick the Exempt from backup withholding. On the part I of the form, you will be required to enter your Tax Identification Number. On the Tax ID Type, Choose EIN and enter your 9-digit EIN as obtained from IRS. On the Part II, do not tick the checkbox. Then enter your name as Signature of U.S Person and click on submit. 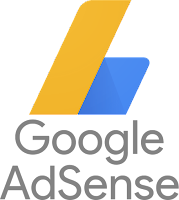 After submitting your tax information, Adsense will compare the information with the one IRS has. This process may take a several hours to be verified. During this process, you will continue to see message about pending tax verification until the verification is complete. This brings us to the end of the tutorial. If you've got any questions, kindly use the comment box below and I will surely get back to you. Is EIN same as Tax ID? EIN is an employer identification number which is a nine-digit number assigned by the IRS. It's used to identify the tax accounts of employers and certain others who have no employees. The IRS uses the number to identify taxpayers who are required to file various business tax returns.. Hope this clears your question. As a Nigerian and am not in USA but using USA AdSense account. How can I obtain mine or verify it?. So you're fooling Google that you're US resident or US resident alien or US corporation or US partnership by clicking "YES", right? I don't see it as fooling anyone if you actually legally obtained the form from the IRS.